Let me start off by saying that this was the coolest race, EVER! 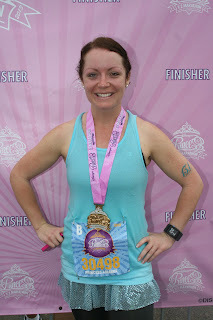 It was my first and most definitely not my last, runDisney race. 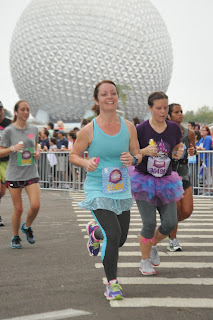 And even better, I got to run it with one of my closest friends. The weekend started out great! 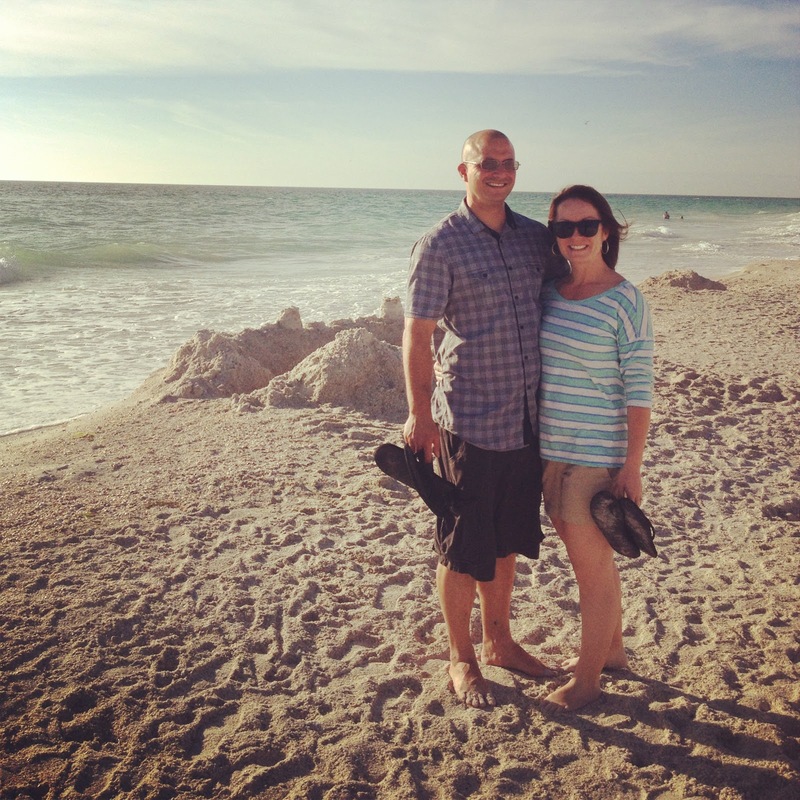 Brian and I traveled to Tampa where our friends live. 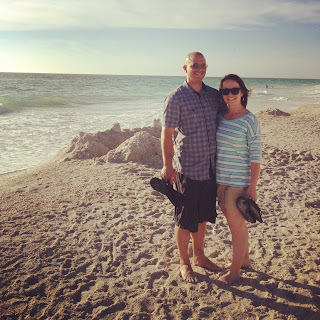 We enjoyed the beach, ate at this awesome restaurant on Anna Marie Island and enjoyed some much needed down time. Our friends, Eman and Shay Tellez own a mobile New Orleans Style Snoball company called, Heavenly Snow. (Check them out on Facebook :) They were working a Renaissance Festival that weekend and Brian and I helped them out. 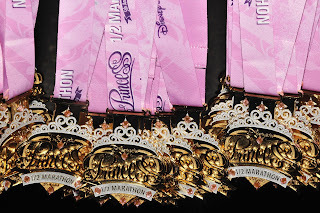 We had a great time, but I wasn't thinking how the 6 hours that I spent standing would affect my run the next day. Saturday afternoon, Shay and I left our hubbies to head to Orlando. We got settled into our hotel and went to check out the expo. We got our numbers and goodie bags. Checked out all the cool vendors. 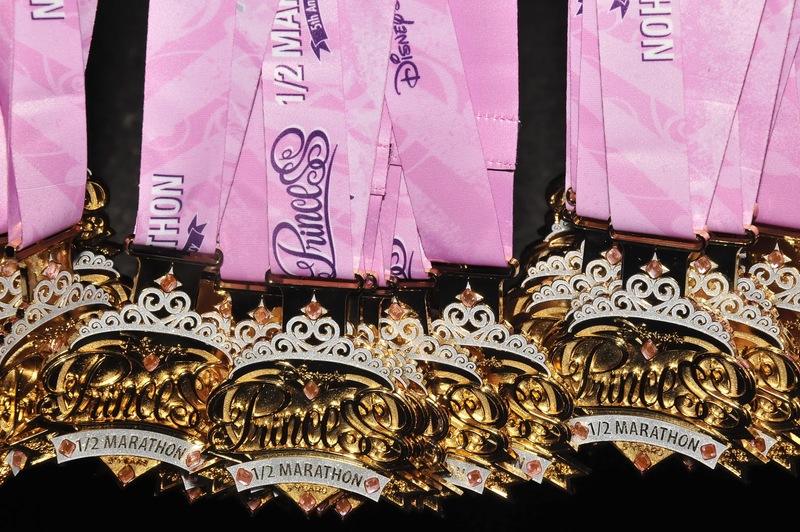 I LOVE all the pink and girly running gear! We were coming to the end of an aisle, when I heard them announce over the loud speaker that Jeff Galloway was going to be speaking in 5 minutes! I freaked out! 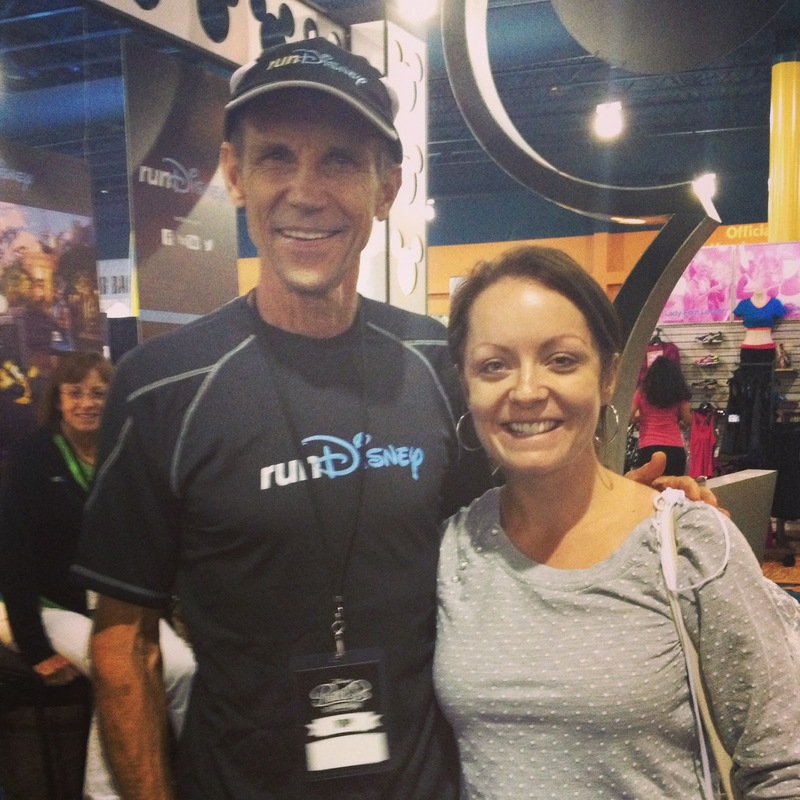 Jeff Galloway is the reason I love to run. His Run Injury Free training is what my friend Beverly got me started on to condition and train to run further and faster. I knew I just had to see him! He's one of my hero's! I look to my right and low and behold who do I see? The man himself! He was just feet away from me, talking with some ladies. So I handed my phone to Shay and waited my turn to speak with him. He was seriously the most approachable guy. I got to tell him my story, talk to him about my IT band issues and he gave me some advice. I even got a picture! We wrapped up the expo, dropped of our goods at the hotel room and headed out to find food. We ate dinner and finally got ready to head to bed. 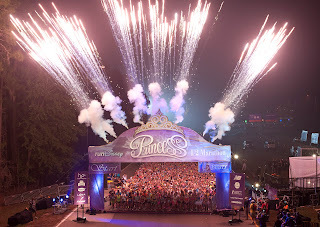 At this point, it was 10 pm and we had to be up at 2 am to be ready so that we could catch the bus to the starting line between 3-4am. Again, not the smartest way to prepare for a race. 2 am came quick and before we knew it, we were on our way to the starting line. 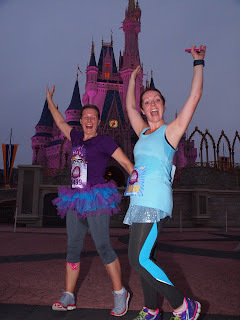 We arrived in our corral around 5 am and we weren't set to take off until 5:45 am. So we had to keep ourselves warmed up. Good thing they had a DJ and were trying to get all of us to do their dances. Fireworks lit up the sky and we were off. It was such an experience that the first mile flew by! I couldn't believe it! 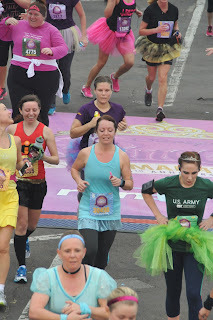 Before I knew it, here was mile 2 and 3, then 4 and 5. At that point, I'm thinking this is going to be a breeze. We were cruising at a 9:45 mile and I know I'm going to PR. 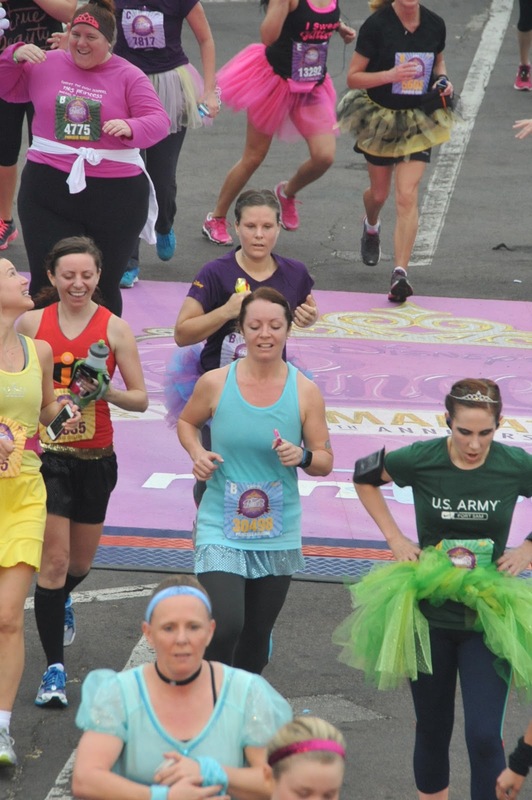 Around mile 5, we entered the Magic Kingdom. Right down Main Street towards Cinderella's Castle. There were thousands of people lining the street, cheering us on. It was the COOLEST feeling ever. We hung a right towards Tomorrowland and ran behind the Castle to run through it. At this point, I was determined to get a picture. They had photographers that were lined up and we ran right up! We continued through Frontierland and out the back lot of Disney. The next 6 miles were going to get interesting. My legs were screaming at me for standing the day before. I've been dealing with IT band issues, but I used KT Tape for the first time, and my knee was doing great! By 6.5 miles, I saw the Half Way Point Sign and I thought, crap this is going to get rough. Miles 7-11 were on the frontage roads around Disney. Bands played at every mile, there were people cheering us the whole time. Nothing to eventful happened, but our pace had begun to slow. The fatigue of the day before and lack of sleep began to set in. 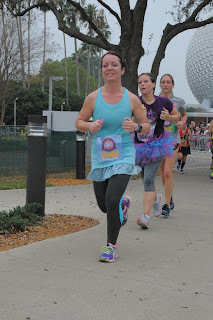 By Mile 11, we could see the Silver Globe in front of Epcot. I knew where we were! Almost finished. 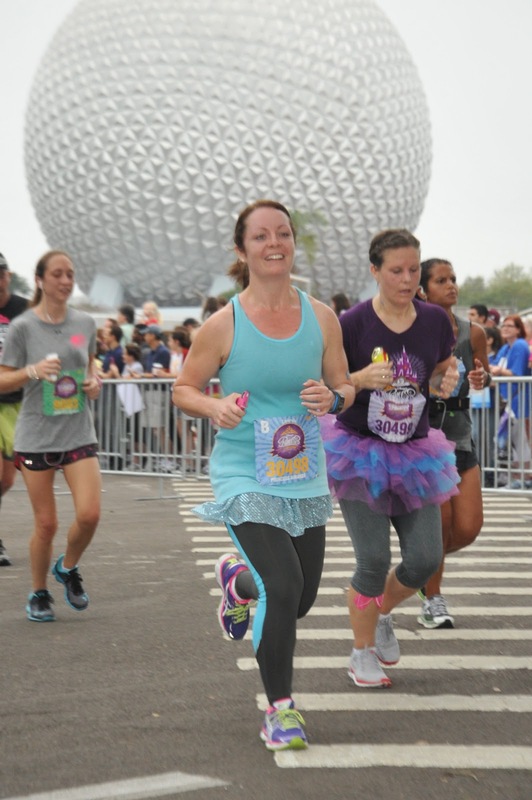 We ran into Epcot and I was like a horse running to the stables. I just ran and ran. I didn't want to stop!